George H. W. Bush, the 41st president of the United States, died at his home in Houston, Texas, on Nov. 30, 2018. He was 94. Bush also served four years as vice president under President Ronald Reagan; director of the Central Intelligence Agency; chief, U.S. Liaison Office, Peoples Republic of China; U.S Ambassador to the United Nations; member of the House of Representatives, 7th District, Texas; and as a U.S. Navy aviator during WW II, where he received the Distinguished Flying Cross and three Air Medals. 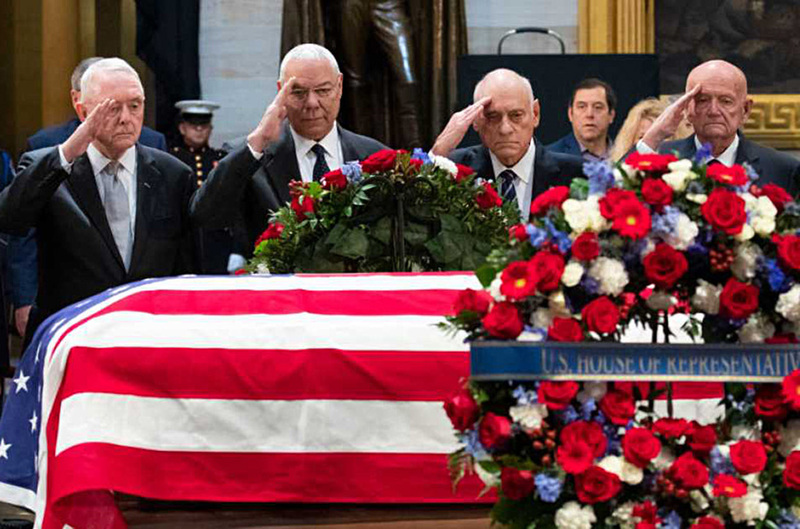 He was interred at the George Bush Presidential Library and Museum on the west campus of Texas A&M University, College Station, Texas, Dec. 6, after lying in state in the Capitol Rotunda, and eulogized in memorial services at the National Cathedral in Washington, D.C., and St. Martin’s Episcopal Church in Houston. In his acceptance speech at the AUSA Annual Meeting’s Marshall Dinner, Bush said, “I’ll tell you how you get a medal like this, you get an Army you can count on and let them do their jobs,” as he reflected on the success of Operation Desert Storm – Operation Desert Shield. Retired Army Gen. Gordon R. Sullivan, former AUSA president and CEO, who was selected to become the Army’s 32nd Chief of Staff by President George H.W. Bush, had a special relationship with the president and shared this story with AUSA News. Sullivan told the News that he admired the former president’s leadership, recalling Bush’s handling of Hurricane Andrew in August 1992 as an example. Sullivan, the vice chairman of the Joint Chiefs of Staff, Adm. David E. Jeremiah, and Deputy Defense Secretary Donald J. Atwood Jr. attended a briefing where they talked about the support the military could provide the Federal Emergency Management Agency, Sullivan said. “President Bush wanted to know how fast I could get there. I told him I’d go the next day. He said, ‘OK,’ and asked me to do two things. First, he wanted me to brief the vice president. Second, after I made all of the decisions and gave all of the orders, President Bush wanted me to call so he’d know how to respond to the many questions he expected,” Sullivan recalled.